Last year I started my mammoth quest to visit as a many May Day customs as I could. I started my journey begun with planning to experience May Day at Oxford. The well renowned University town is noted for its unique May Day morning; a strange smorgasbord of customs. However, I had read a small note of something rather unique and low key the night before and after checking into my accommodation I decided to investigate. This supplementary custom occurred on the common at the edge of Oxford, so I decided to venture in the darkness of the wide open space. It was an all or nothing venture. This was something not official nor confirmed – I couldn’t find anything online particularly on Facebook. But nevertheless I decided it was worth exploring. It was pitch black and I walked a few yards along the causeway looking for evidence of any activity. I felt quite unnerved to be honest. The common was a black void, lonely and forbidding. After an hour I couldn’t see anything and was about to turn back when I saw a flickering light in the distance. Was this it? I walked nearer and could hear music. Closer and it revealed itself to be a small group of twenty somethings around a fire listening to music. 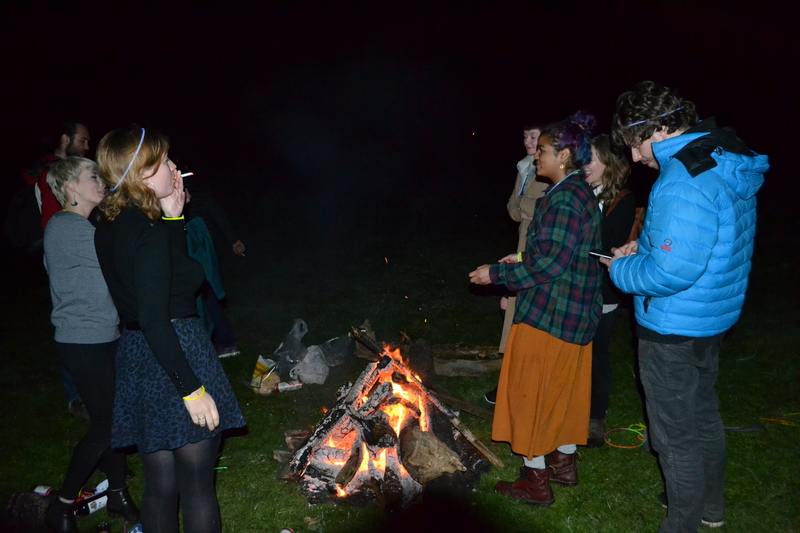 They were quite bemused by my appearance and said ‘They is a much larger bonfire around the corner’. May it be a survival? Interesting until recently cattle were being pushed through such fires in Ireland and Scotland until the 19th century. As a form of purification for the new year. 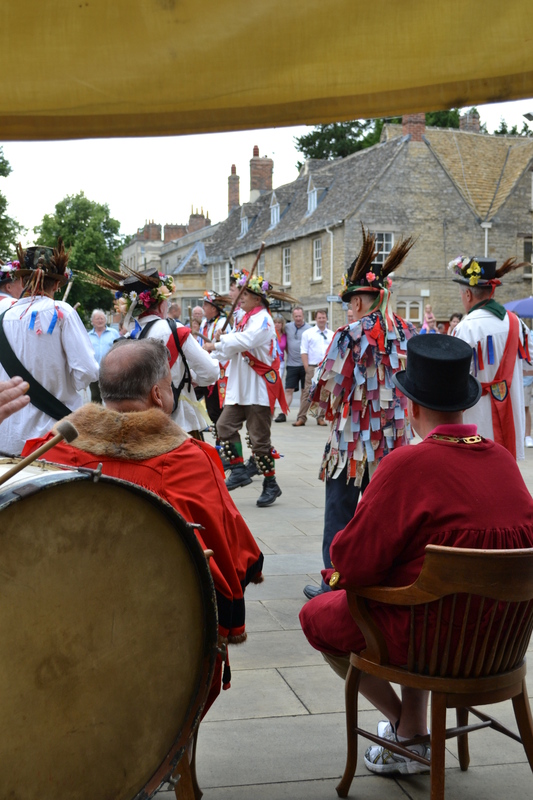 A survival in the Celtic homelands is plausible – but in genteel Oxfordshire unlikely. Despite the link between Port Meadow and grazing thereabouts! Well I decided to explore with some degree of trepidation! After a fair walk, I thought it was a wind up. But then I could again hear sounds and see flickering flames in a small opening in the woody area. Making my way through the foliage I found a larger group of people surrounding a larger bonfire. 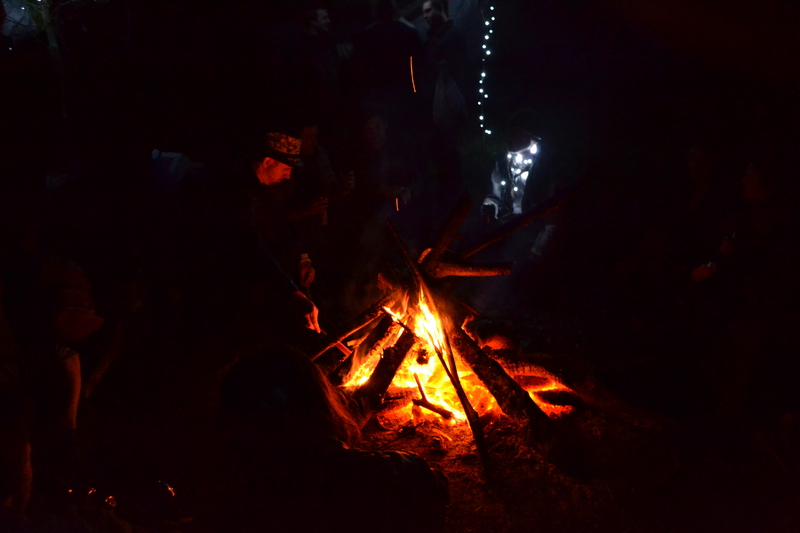 In their little arbour surrounded by fairy lights tangled through the undergrowth there was much chatting and laughter as they listened to the music and drank. 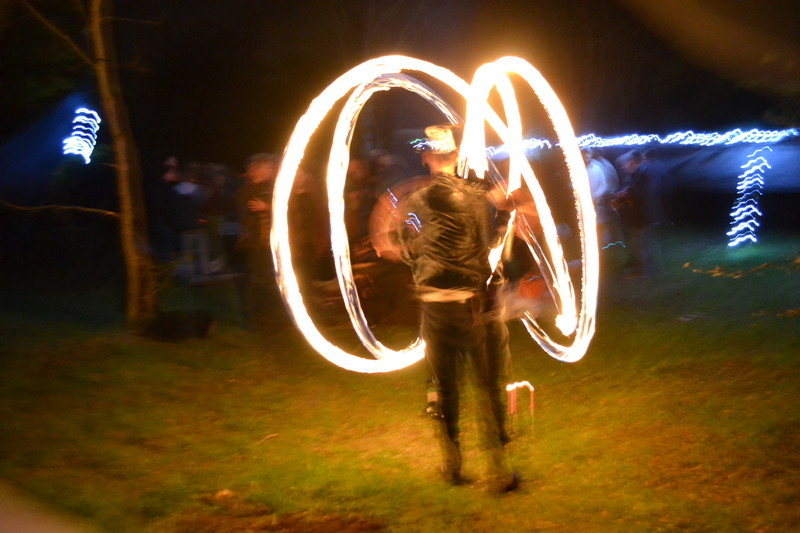 Nearby was a reveler spinning around some flaming balls to great effect. All in all ,a typical rave akin to those of the 1990s, but this one being tied to a date made it of interest to the folklorist. I asked about the history of the custom. One of the organisers said that their parents used to do it and they would attend as children. It was more a town event than the May morning after was most definitely gown event and had been going at least 40 years. She then said that a few years back they as adults went out looking for the fires one May Day Eve and being disappointed in not finding any decided to get organised the year after and do their own. Ten or so years later they were still doing it. This was a big one of course as May Eve was on the weekend without any work restrictions. She was unaware of its significance of the fires, but her name ‘Stardust’ I think explained its origins! A new age custom taken up and brought back to life by the neo-pagan parents, but now strangely like many ancient customs its significance not known to the current celebrants. This in a way indicates how quickly the meaning behind customs is forgotten. Which in a way is good as its celebrated as deemed fit. The whole affair was very convivial and relaxed; so much that I wish I had stayed longer and not booked somewhere to stay, especially as it was such a fine evening. 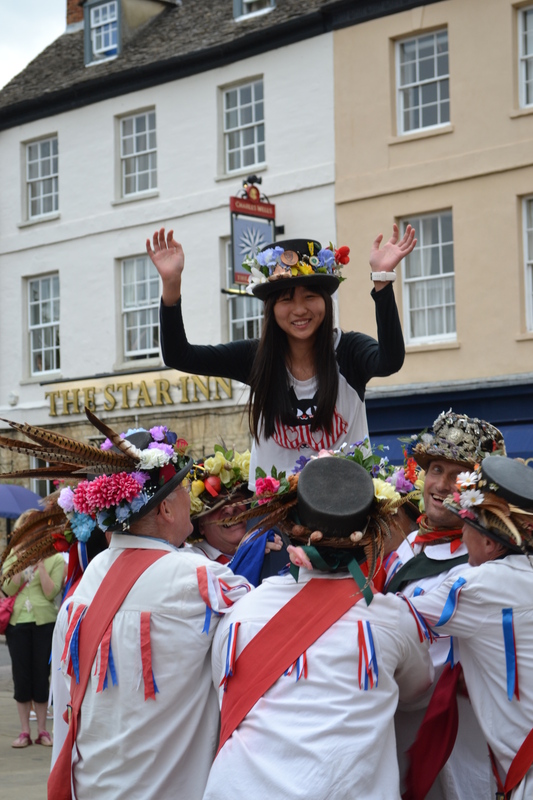 Oxford’s May Eve celebrations are the very best of our British customs – an event special to its community, secretive but not exclusive. 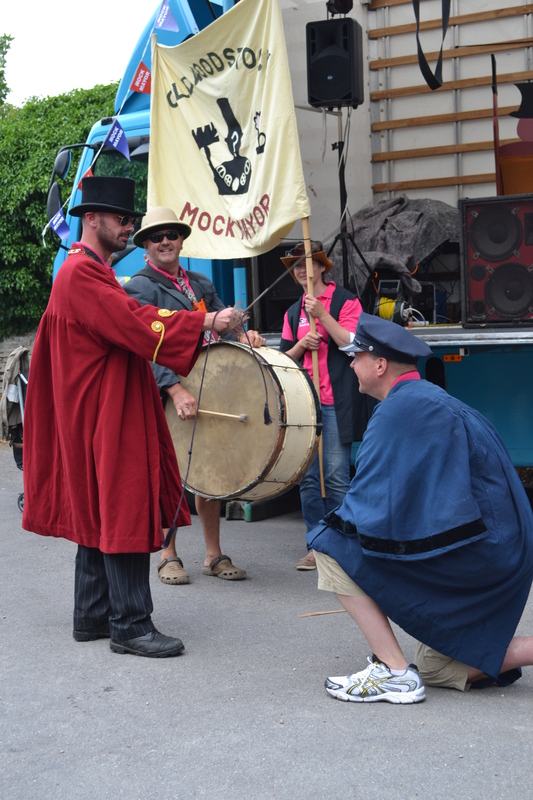 The Old Woodstock Mock Mayor is a little known custom which appears to have been ignored by books on calendar customs, but it is a classic example of the reason behind the establishment of this perhaps most English of traditions – taking the mickey! 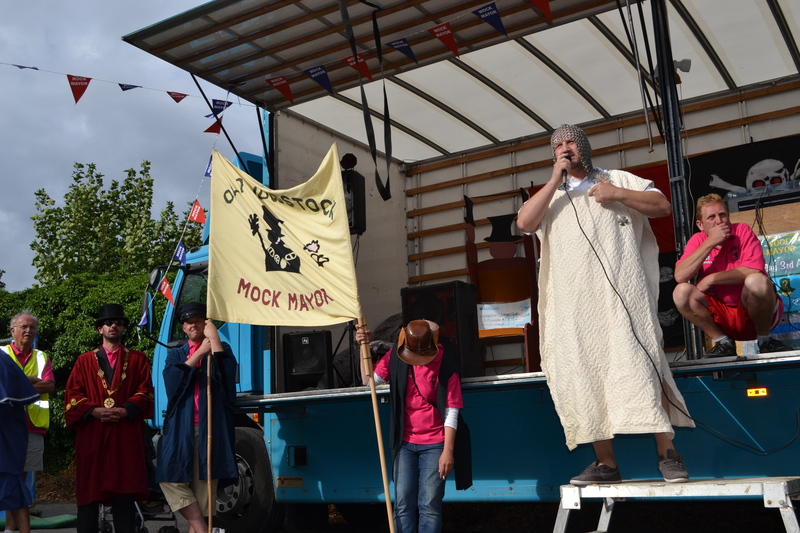 The election of the Mock Mayors in this case was a response to the newer Woodstock over the stream! This is because Old Woodstock was until 1886 in the parish of Wooton when an independent of the borough of “new” Woodstock arose and so the custom developed as mockery of the Borough authorities in the new Woodstock who had by 1776 built themselves a new Town Hall and so they responded with this light hearted repost. The custom continued it appears without break until 1928. Why the custom died out in 1928 is unclear, but it was probably due to the First World War. However, whereas in most cases this would bring the end of the custom it was revived in 1954. This new Mayor wore a crimson gown made out of a 19th century blanket, a chain of curtain rings and a top hat. 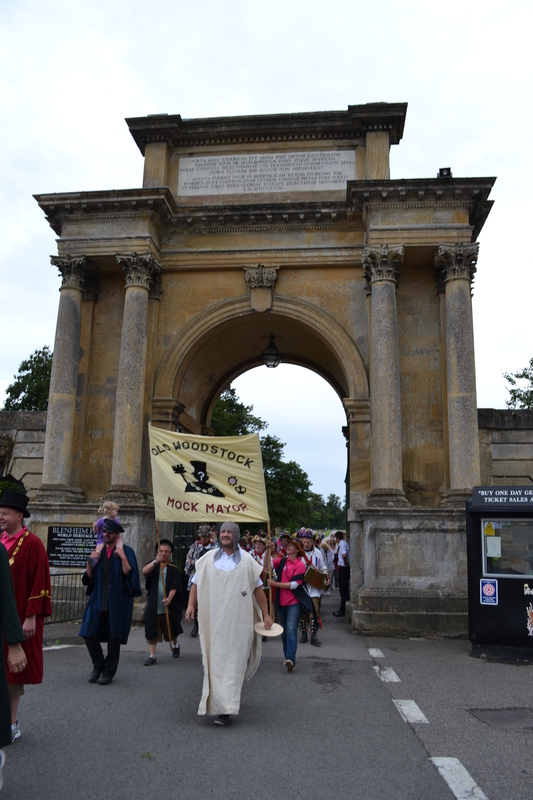 The event was associated with the Rose and Crown and unlike today it never crossed into New Woodstock. 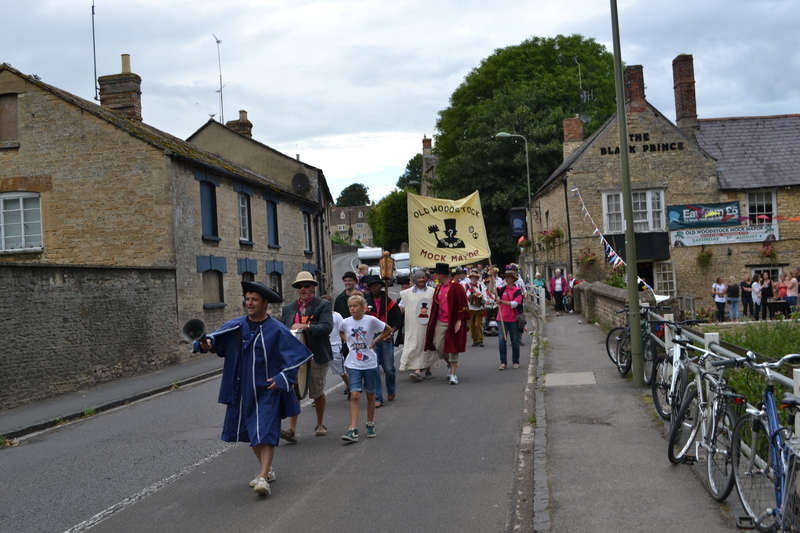 Evidence suggests that originally the custom was associated with the Wootton Parish Feast Day which was the 19th September, but this revival moved it to August Bank Holiday. The event saw a Beauty Queen and Flower show as well. The revival was short lived and although it saw its first female Mayor, a Miss K. Castle, with the installation of Mr Frederick Warmington in 1958, the custom lapsed and so for 25 years he remained the reigning Mock Mayor! Like other Mock Mayor the regalia which resembles that of the real Mayor but at half the price. However, this regalia appeared to have become a bit more sophisticated: a Mayoral chain chained from curtain rings to mechano metal pieces, a black top hat, a robe of office said to be made from a 19th Century red blanket. The mace did consist of a holly stick entwined with a large cabbage stem capped by a crown but is now a more sophisticated three sided wooden mace. Clearly the mock mayor is more serious matter now! Despite what could easy be described as a local event, this is a tradition with all the regulars: coconut shy, plate breaking, Punch and Judy and Oxfordshire favourite Aunt Sally. 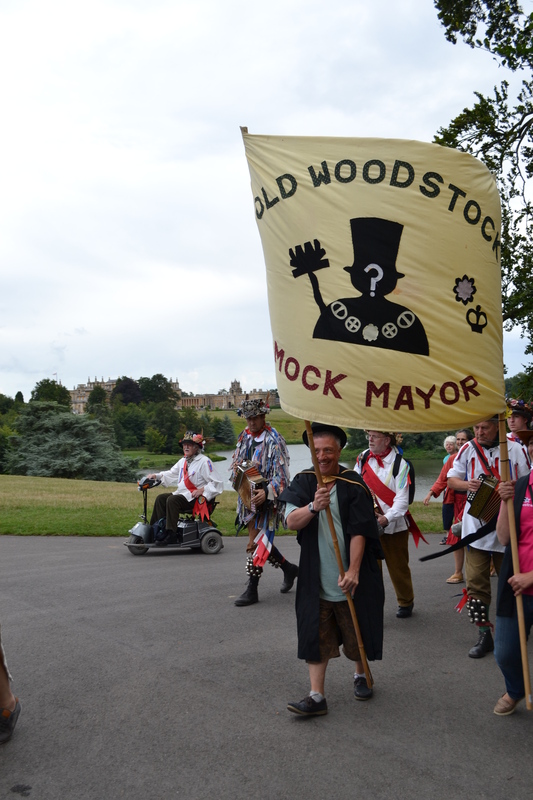 At the allotted time a motley bunch appeared made up of the Mock Mayor, his deputy, a constable, Town Crier, Mace bearer, two flag bearers and an inexplicable Saxon Warrior an odd dressed group if ever there was one. 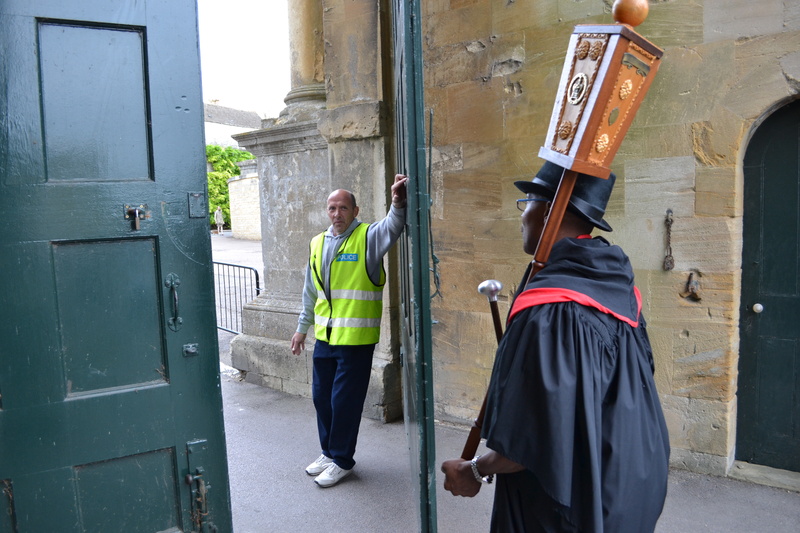 Then the ‘town’ cryer with his blue frock coat and black tricorn hat asked those intending to stand or those representing those intending to stand to join in the hustings….there was a bit of an embarrassing silence. Then a few people stood up to appeal for election, in 1993 one candidate promised to bring the Olympics to Blenham Park and promised good weather. I’m not sure which was more probable. In 2013, the crowd appeared a little reticent although one candidate, perhaps the crowd knew it was a fix! Of those who stood one candidate suggested they would investigate fracking…at New Woodstock whilst a young boy boldly proclaimed he would make the village more interesting…he didn’t win! After the hustings the committee huddled in the corner to agree what had already been agreed – and selected the new Mock Mayor. Previously the adjourned to a room in the pub and white smoke was sent up. The outgoing Mayor caused the newly appointed to kneel to which he then knighted him and passed on his robes. 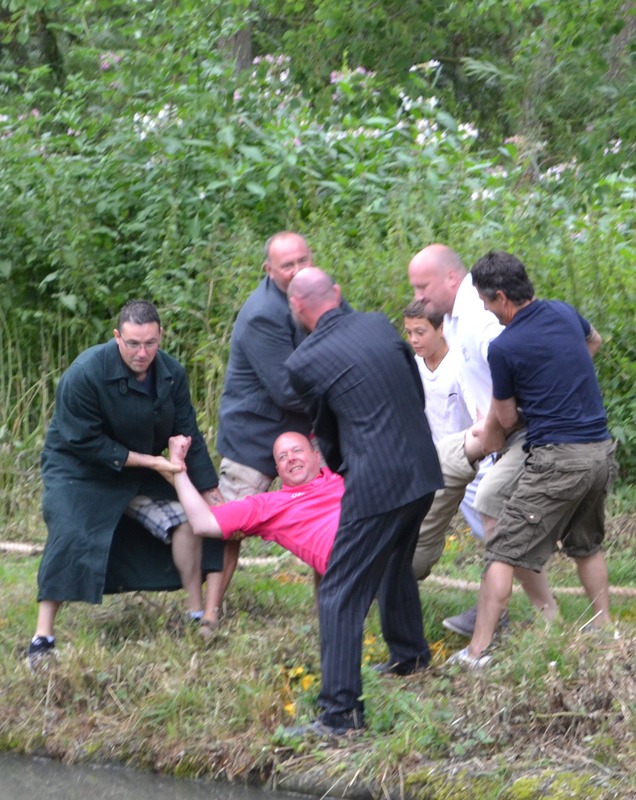 It was made clear that the new Mock Mayor had already been selected, making a mockery of the whole custom- perhaps due to the ducking aspect and whole ‘health and safety’ its best they know who it is…a random member might not be so happy with the impromtu swim! The climax of the ceremony is the ducking of the Mock-Mayor. Although this was a bit confusing because although there was a ducking stool set up, the process appeared to consist of simply throwing him in the water. The ducking signifies the Mayor and the Corporation turning their backs on and declaring their independence from the “other” Woodstock by crossing the boundary line. A similar ducking of a Mock Mayor occured in Birmingham in a local holy well and it is possible that this part of the procedure is the oldest part…did it signify a water sacrifice? 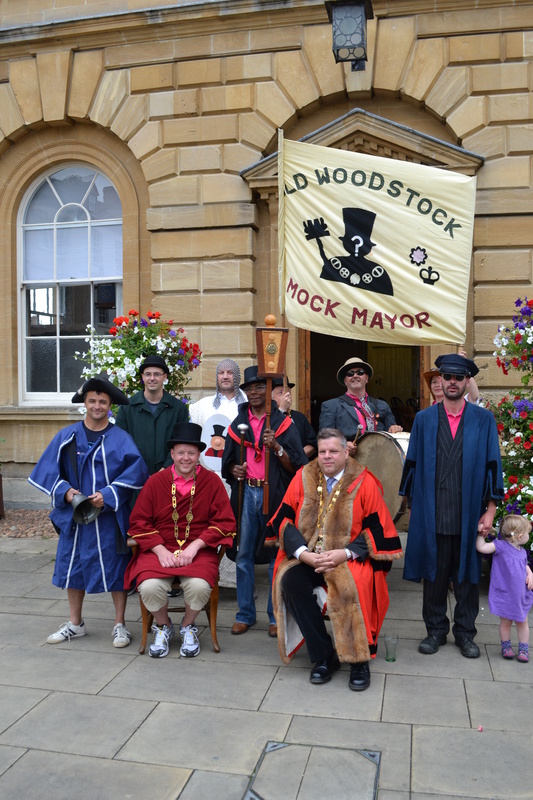 Despite its rather frivolous nature, Old Woodstock’s Mock Mayor is the closest to the true nature of the mock mayor tradition across the country – still metaphorically raising its two fingers at the New Woodstock…Or should I say both two fingers…its W oodstock after all! Copyright Pixyledpublications if you’d like to use the photos contact me.